Brigadier General John Lathrop, who is now the Assistant Division Commander, 40th Infantry Division of the California National Guard, will be the reviewing officer for the Pacific Palisades Fourth of July parade. Lathrop’s family has lived in California since the 1930s, when both sets of his grandparents moved west during the Depression. He grew up in Bakersfield, but his parents had been raised in El Monte. His father was drafted and served during the Cuban missile crisis in 1961. Lathrop attended UC Riverside and was a member of the Army Reserve Officer Training Corps (ROTC) through the Claremont Colleges. He graduated in 1986 with a degree in political science, and in December received his Army commission. He was sent to South Korea as a survey officer and then as a fire direction officer of the B Battery, 1st Battalion. In 1990-91, as a member of the Active Component, he served in the Demilitarized Zone in Korea and in Southwest Asia during Operations Desert Shield and Desert Storm (the Persian Gulf War). Lathrop then returned to California for assignments in Van Nuys, Bakersfield and Los Angeles with the National Guard. During the Los Angeles riots and the aftermath of the Northridge earthquake, Lathrop served as a traditional Guardsman. He commanded the 115th Regional Support Group and served as Chief of Staff for the 40th Infantry Division. In 1998, Lathrop received a master’s degree in business from the University of Redlands and was sent to Fort Leavenworth for a command and general staff officer course. He completed an international strategic studies program at the Fletcher School of Diplomacy at Tufts University in 2005. Immediately after completing the course, Lathrop was deployed to Balad, Iraq, as the Deputy Commander, 40th Corps Support Group in support of Operation Iraqi Freedom IV. As a member of the Active Component, he served in the Demilitarized Zone in Korea and in Southwest Asia during Operations Desert Shield and Desert Storm. His awards and decorations include the Legion of Merit, Bronze Star, Meritorious Service, Army Commendation, Army Achievement medal, Iraq Campaign Medal, Global War on Terror Service, Kuwait Liberation Medal and Combat Action Badge. 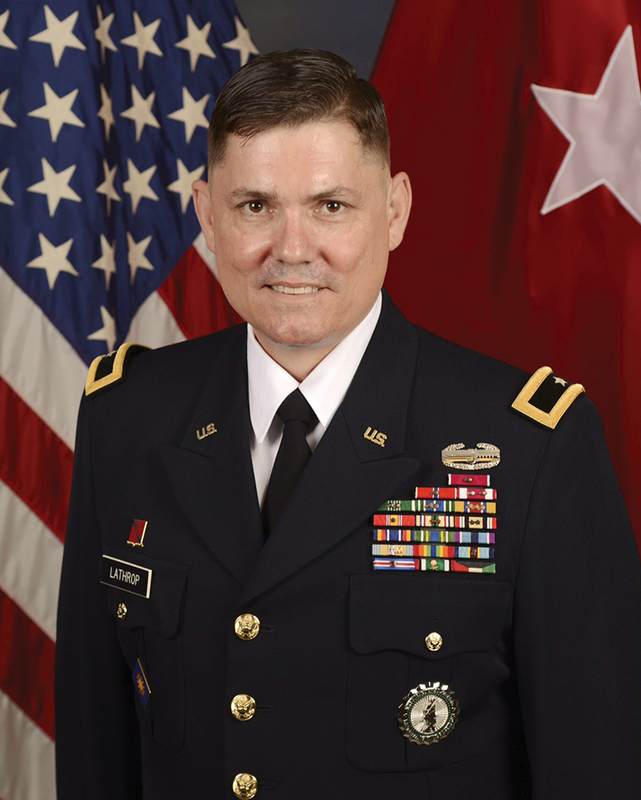 Lathrop was promoted to Lieutenant Colonel in August 2000, and five years later he made Colonel. A year ago, he attained the rank of Brigadier General and is currently based in Los Alamitos. This July 4, Lathrop had a choice between going to Los Alamitos, starting at 5 a.m., or coming to Pacific Palisades. He chose the Palisades, because he’s been invited to the Orange County location and has attended several functions there, but this would be his first official function here. Lathrop admits he hasn’t been in many parades. He remembers one in Roseville, California, when the family rode on an antique firetruck. For the Palisades parade, he’ll be accompanied by his wife Mary. “I’m not at all practiced with the Cinderella wave,” he said. He was told that Palisadians were friendly and were just thrilled he would be in the parade. If you have a VIP ticket, you can meet the Brigadier General at the luncheon before the parade. Earlier, he will meet with members of American Legion Post 283 at their hall on Antioch.